"Wonder Woman" is the first stand-alone feature based on the DC Comic's character of the same name. Most critics are raving about “Wonder Woman,” the first stand-alone feature based on the DC Comic’s character of the same name. Starring Gal Gadot, the film presents the origin story of Wonder Woman, aka Diana, Princess of the Amazons, aka Diana Prince, who grew up on a woman-only island of Amazons. When she learns of a great war (WWI) being fought on far away lands from American fighter pilot Steve Trevor (Chris Pine), whose plane is shot down and crashes on the island, she is compelled to end the war. The film is getting high marks from critics, it scored 93 percent on Rotten Tomatoes, and is poised for a blockbuster opening. A.O. Scott of the New York Times says “it’s a Blockbuster that lets itself have fun“: “Wonder Woman,” directed by Patty Jenkins from a script by Allan Heinberg, briskly shakes off blockbuster branding imperatives and allows itself to be something relatively rare in the modern superhero cosmos. It feels less like yet another installment in an endless sequence of apocalyptic merchandising opportunities than like … what’s the word I’m looking for? A movie. A pretty good one, too. Andrew Barker of Variety says “Patty Jenkins and Gal Gadot breathe some fresh air into the DC film universe“: “Wonder Woman” is the first major studio superhero film directed by a woman, and it shows in a number of subtle, yet important ways. As skimpy as Gadot’s outfits may get, for example, Jenkins’ camera never leers or lingers gratuitously — Diana is always framed as an agent of power, rather than its object. 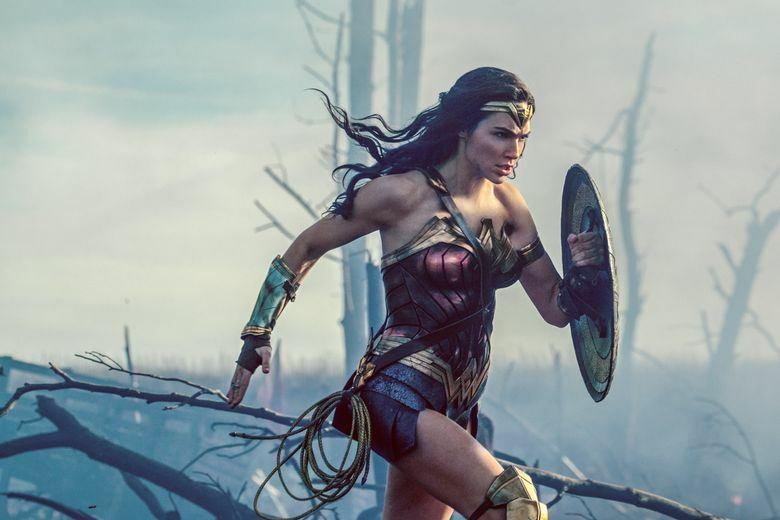 When she finally unleashes her full fighting potential in an extended battle sequence on the front lines, the movie comes alive in a genuinely exhilarating whirl of slow-motion mayhem, and Diana’s personality is never lost amid all the choreography. Entertainment Weekly’s Chris Nashawaty hails it as “the smart, satisfying DC movie you’ve been waiting for“: “Wonder Woman” is smart, slick, and satisfying in all of the ways superhero films ought to be. How deliciously ironic that in a genre where the boys seem to have all the fun, a female hero and a female director are the ones to show the fellas how it’s done. Not all are convinced, the Guardian’s Steve Rose says “Those hoping a shot of estrogen would generate a new kind of comic-book movie – and revive DC’s faltering movie universe – might need to lower their expectations“: Like many people out there, I had no shortage of excitement and goodwill towards this female-led superhero project, but in the event it’s plagued by the same problems that dragged down previous visits to the DC movie world: over-earnestness, bludgeoning special effects, and a messy, often wildly implausible plot. What promised to be a glass-ceiling-smashing blockbuster actually looks more like a future camp classic.